The VegU featured item is always the key ingredient in the "VegU-cation" lesson. This special event creates opportunities for customers to ask questions. With more knowledge, customers are willing to purchase the new fruit or vegetable; ultimately resulting in more sales for market vendors. USDA Photo by Preston Keres. Everyday USDA works to develop tools for farmers and ranchers that support their financial success. 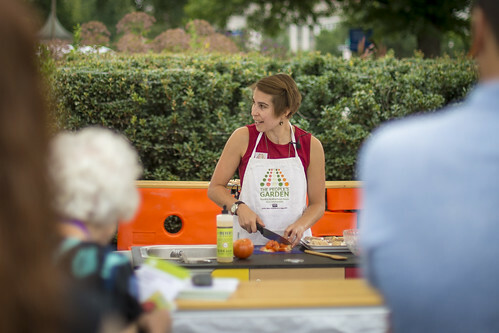 The USDA Farmers Market on the National Mall is a “living laboratory” for farmers market operations across the country. During our 2017 market season, we tested “VegU-cation” and found that this fruit and vegetable education program was popular with our visitors and increased sales for our farmers. Visitors to our market attended a 10-minute demonstration class in the VegU tent, on how to grow, pick, and prepare that week’s featured fruit or vegetable. 1. Use Simple and Creative Recipes – Customers are more likely to consider making a recipe, using the featured item, if it has just a few ingredients that are easy to assemble. Keep the preparation demo to five minutes or less. Highlighting new ways to prepare an item that shoppers may have never considered, like roasted avocado instead of guacamole, works great. Add a toppings bar to a simple recipe to make it more interactive. During a demo last year, VegU featured mangos, with a toppings bar of lime hot sauce, salt and pepper, cumin, and cayenne pepper. This extra feature gave participants a chance to try some of the many ways a mango can be enjoyed. 2. Showcase Variety to Create Interest - Offering variety increases customers’ willingness to try new foods and can make a farmers booth vibrant and inviting. We spotlighted lesser-known varieties of apples and pears, grown by our farmers, during a VegU session. The presentation included “fun facts” along with the variety names, distinguishing characteristics and suggestions on the best varieties for snacking, baking and salads. A similar display for mushrooms listing names, flavor and texture profiles, as well as preparation suggestions, worked really well. 3. Provide Free Samples - Free food gets attention! We have found that serving samples halfway through the demo keeps folks interested. Once they taste it, they often want to buy the featured item and try the recipe. Talking about nutritional value and asking participants to share their favorite recipes also helps to engage your audience. 4. Share How Things Grow - We found that displaying and talking about live plants, grown in the USDA greenhouse or brought in from nearby nurseries and farms, encourages customers to taste and purchase unfamiliar vegetables, like okra. VegU helps shoppers improve their knowledge about seasonal availability of fruits and vegetables and learn more how the foods they love are grown. 5. Don’t Be Afraid of Challenges – For farmers, growing an unfamiliar product can be challenging in an unknown market. However, VegU presentations on new or unusual items can create a great deal of interest amongst shoppers. We have found that shoppers are interested in learning about these out-of-the-ordinary items like how to prepare kohlrabi or fennel. VegU often resulted in vendors selling more of the featured vegetable or fruit – sometimes selling out! Activities like our "Guess the Mystery Vegetable" game engage audiences and encourages them to try new things. VegU is just one example of a special event to build market support for farmers. We also asked farmers market managers across the country to share what helped make their markets better. Many told us that hosting special events, offering community programs, and other activities added to their success. 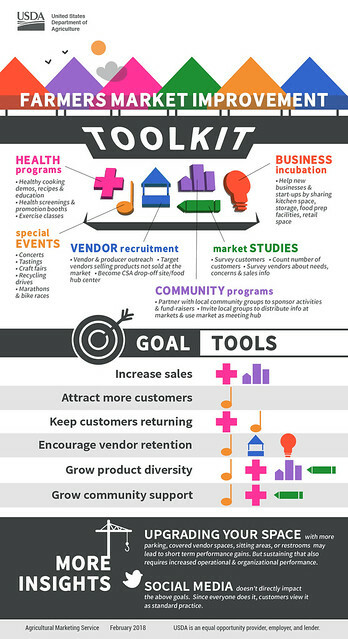 Checkout our Farmers Market Improvement Toolkit for more ideas. If you are in our Nation’s capital, please join us at the USDA Farmers Market and stop by the VegU tent. Come any Friday from 9 a.m. - 2 p.m., from May through October, right outside USDA Headquarters at 1200 Independence Avenue, NW, Washington D.C. Sign up for our new free online newsletter to get updates about the 2018 USDA Farmers Market, all season long. You can also find a market near you through our National Farmers Market Directory. We asked farmers market managers across the country what things added to their success. Our new Farmers Market Improvement Toolkit shows how your farmers market can grow. Click this image to view a larger version. Now 26 year old has been implementing all of these ideas for 20years! Now, if we could only get help from the USDA on taking our market to the next level? Dealing with bureaucrats at our college campus location is stifling, to say the least. Then maybe our market would not struggle so much.